In my mid 30s, just as things were starting to flow well in my career, I made the decision to reeeeally get out of my comfort zone and take on a monster challenge. I left my beloved but comfortable role as a General Manager at Nike to relocate my young family to Chicago. I was going to be the leader responsible for turning around the epic but declining sports brand, Gatorade. In the interview process I had totally hit it off with the energetic Italian CEO of PepsiCo America’s beverages, Massimo D’Amore, whose personality was as big as his hand gestures. And with his encouragement, I felt sure I could do it. I mean, how hard could it be? Well… 18 months into my time with the company there was no light in the tunnel that the business was going to turn around. Right after the birth of my third child, laced with the anxiety of post natal depression, we were struggling with a sputtering economy and the launch of a rebranding campaign (that I had driven, btw) that was a hot mess. With revenue dropping in double digits every month, I was definitely questioning my Extremer approach to reviving the company. And guess what? I can still remember countless nights walking in the door to my hubby, and just crumbling into a puddle of tears. It all seemed just so bloody hard – and there was NO guarantee of success. I had so many sleepless nights thinking that I had totally fucked up my career by taking this job. I thought about throwing in the towel, and leaping to the safety of a different job at a company that was already healthy. 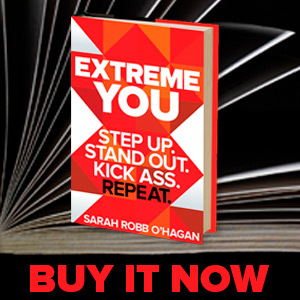 I, Extreme Sarah, was discouraged, exhausted, and scared. Booom! So simple but SO bang on! Did I mention that this man was one of the most challenging yet supportive bosses I’ve ever had? SUCH an awesome partner. I’ve since learned he was referring to “Crossing the Rubicon” a metaphor based in Roman history that basically means to go all in. The Rubicon is the river that Julius Caesar crossed into Italy with his army in 49BC, a choice that sparked a civil war (talk about making a tough decision!). On one side of the river he had to weigh his options and consider the consequences he might face. But once he crossed that river, he was committed – there was no turning back. Recently, GirlBoss CEO Sophia Amoruso and I got on the topic of the Rubicon when she had me on GirlBoss radio. She told me about a time when she had to cross a really scary overpass on a hike (which happened to be one of the most dangerous hikes in the world – she’s a total badass!). She knew she would have to cross this point, a quarter mile of thin rock over a sheer cliff, when she started the hike. She knew she would be afraid when she got there, and that she might want to turn back. So, she choose to do the hike in a way that she HAD to cross this treacherous path. She had two options: conquer the overpass, or hike back to no man’s land. By giving herself no way out, she was forced to finish the hike, and, tears and all, confront her fears. Sophia’s story is a great example of how growth happens when you don’t give yourself the option of backing out of a decision. In this era of instant gratification, so many people are easily discouraged by challenges and jump ship too soon. We see employees hopping from job to job every 12 – 24 months because they don’t like the circumstances or the difficulties of their new position. What they don’t realize is that they aren’t getting the depth of experience and growth that comes with seeing a journey through – whether it’s good or bad, whether you succeed or fail. When you give up right when the going gets tough, you’re hiking yourself back to where you started, missing out on all the self development you could have seen had you stuck it through. What I learned from the struggle at Gatorade is that if you want to achieve a goal, you have to go all in. Committing to the end is giving yourself no way out. 1. Give yourself a time commitment. When you first take on a big new goal, give yourself a deadline. That way when the going gets tough (which it will), and it becomes easy to justify reasons to quit, you can circle back to that time commitment to remind yourself to power through. 2. Accept that there will be roadblocks. On the journey to becoming an #Extremer, roadblocks are inevitable. There will be times when you get discouraged, when you question what the HELL you’re doing, or if you’re even on the right track at all. Accept this as part of the process, and see these difficult moments as learning opportunities instead of a reason to give up. 3. Make sure to get plenty of rest and refueling along the way. Julius Caesar didn’t cross the Rubicon alone. He did so with the support of a WHOLE ARMY behind him. Likewise, when you’re in the middle of crossing your personal river, carve out time to take a break, be with family and friends, and get a fresh perspective. Getting across the river is a team effort! 4. Remember that the “other side” may not end up being what you hoped it was going to be. Accomplishing your goal almost always looks different at the end of your journey than you might have pictured at the beginning. Had Sophia defined success as totally overcoming her fear of heights, she could have labeled the hike as a flop. Instead, she focused on an accomplishment that she may not have been able to picture when she started the hike: her resilience to face something totally scary, but do it anyways. The end may not be what you expect. Nonetheless it IS new undiscovered territory for you. So no matter what, it’s worth getting to the other side to see what lessons are waiting for you. This lesson about crossing the Rubicon has served me well in so many areas of my life. From the decision to go all in at Gatorade, which led to one of the greatest career triumphs of my life, to the decision not to bail on the half iron man I was struggling to train for a couple of years ago, and the utter feeling of joy when I crossed the finish line and realized I COULD do it. So next time you find yourself contemplating jumping off the struggle bus – think about the river and whether it’s really the right decision to go back to where you started. The glorious feeling of self growth probably lies right on the other side.